Electronic Arts continues its re-release of classic video games with SNOOD. Steve Wozniak, Co-founder of Apple once listed SNOOD as one of his favorite games. First released in 1996 it has since seen several new versions, the latest of which is brought to you on the iPad, iPhone, and iPod Touch. For those not familiar to SNOOD the game is played by aiming and launching pieces (called SNOODs) into groups of 3 or more to make them disappear. Every few turns the ceiling moves down a notch, and the object is to clear all the SNOODs before they get to the bottom of the screen. Think Bust-a-Move, except the pieces have faces (and there’s no cute dinosaurs). As always SNOOD comes in five difficulties ranging from “Child” to “Evil”. It also has four game modes: Classic, Time Attack, Puzzle, and Story. The game modes don’t offer drastic changes in gameplay, but they do add a slightly different way to experience the game. There is always a dilemma when remaking a game in deciding whether to favor staying true to the classic or exploring new boundaries. Whatever route is picked there is certainly always someone at the other end of the fence ready to complain. To help remedy this issue SNOOD offers the option of using either new or old style of SNOOD animations. Including these types of extra features to keep both sides happy is a practice Electronic Arts should make standard in all its remakes. Those who played the old SNOOD will remember how difficult the aiming system could be. Sometimes you could have sworn your shot should have perfectly wedged between two SNOODs, but somehow it didn’t quite fit. The new SNOOD is much more forgiving in the aim department, which comes as a welcomed change. Being able to aim by tapping the location is another feature that adds accessibility. The new easier controls by no means equate to SNOOD being watered down to an easy game. Users are still on their own when it comes to bouncing shots off the wall, a maneuver which has always been the most difficult part of the game. 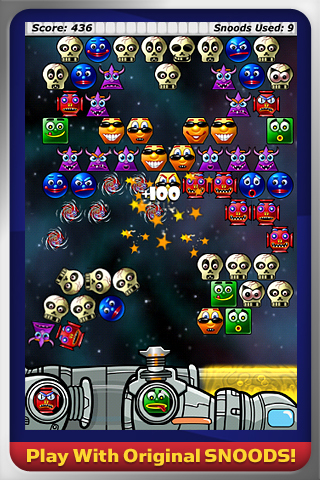 SNOOD is available for $0.99 in the App Store. Definitely worth a download, SNOOD continues to be a great puzzle game which has entertained us for the last fifteen years. 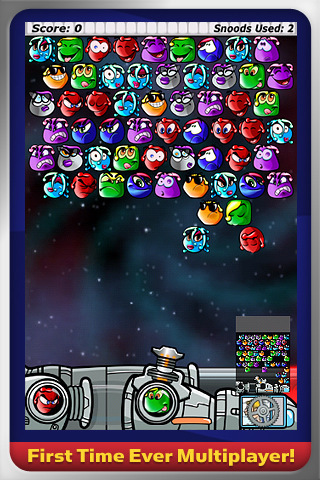 AppSafari review of SNOOD iPhone game was written by Neema Akhtar on September 13th, 2011 and categorized under App Store, Arcade, Games, Puzzler. Page viewed 5331 times, 2 so far today. Need help on using these apps? Please read the Help Page.